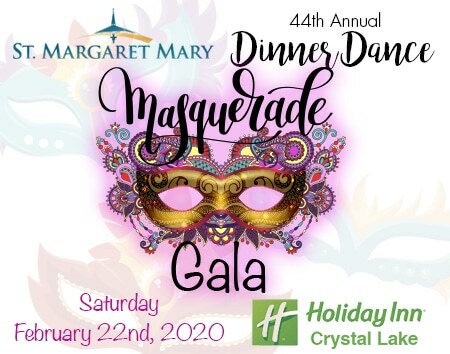 The Dinner Dance and Auction is the major annual fundraiser for St. Margaret Mary Parish. This event is being held Saturday, March 2, 2019 at 5:30 PM at Holiday Inn, Crystal Lake. This year’s event promises to be a wonderful Evening with great Live Auction items, fellowship and more! Look for our sign-up tables after Mass in Bethany Lobby prior to the event! More details and updates to follow… Don’t miss this great chance to have an awesome time, fellowship with your parish friends and an elegant evening at an incredible value! Our event is being held at the Holiday Inn, Crystal Lake. Address is: 800 S Illinois Rte 31, Crystal Lake, IL 60014 (Phone: (815) 477-7000). This elegant evening begins with a fine selection of hors d’oeuvres and premium two and 1/2-hours of open bar. This will lead into our fine dining experience. After dinner, Déjà Vu will take the stage, but not before we round out our festivities with the always popular live auction. Our evening will conclude with a mix of dancing and fellowship. Spend some time and treasure in the company of good friends. Hurry, seating is limited… so buy your tickets today! The idea for the Dinner Dance benefit originated 1974. The first fundraiser was held the following year and raised $3,000. This project has grown from a small gathering in the school basement to a large scale banquet hosted at a local country club. It now represents a substantial portion of the annual operating budget and all proceeds from the event itself will be put towards Parish expenses and debt. The benefit raises funds to help meet the needs of day-to-day Parish expenses and support the various ministries of the Parish. It has eliminated the need for multiple smaller fund-raisers during the year. The live auction usually begins after dinner. Auction donations have included vacation trips, group party packages, theme sponsored dinners, celebrity sports items, and hundreds of goods and services. These donations are obtained from local area businesses and individuals. The evening begins with an open cocktail hour accompanied by full viewing of all auction items. The dinner is served from 6:30 p.m. to 8:30 p.m. with the band playing music from 9:00 p.m. to Midnight. Parishioners make this event happen with either their paid attendance, volunteer work, generous sponsorship, raffle ticket sales and purchases and vocal support of the event. Your support for this event has been overwhelming in past years and we would like to continue that tradition. If Attending, bring a Friend! The Dinner Dance, Parish Raffle and other Parish fundraising activities are now managed by the Parish Dinner Dance & Fundraising Ministry. Our Mission: To serve our Parish Family at a critical time. In doing so, we will all be blessed. To find out more… Attend meetings. Ask questions. Follow church bulletin updates. Contact Morgan Stencil via Email. Any help is always appreciated. How Successful is this Fundraising Event? This event historically raises anywhere from $20,000 to $30,000 Our goal is $20,000 from the event. All money is then turned over to the Parish and applied towards our Parish expenses and debt. Our goal this year is to have upwards of 250 people in attendance who are looking forward to a wonderful night of good food, dancing, and fellowship.